converts a print job to grayscale or 2-sided (users cannot contravene this change at the device anyway). Users who are able to release delegated held print jobs originally printed by other users (Users Details page > Advanced Options area, Allow this user to release jobs printed by others (Delegated print release)) are not allowed to change the settings of such jobs on the device. Printers with Filters and Restrictions limit and control a user's ability to change the settings of held print jobs on such printers. If changes made to the settings of held print jobs contradict the printer's Filters and Restrictions, then the device displays an error, preventing the job from being released. The held print job is released only when its settings comply with the printer's Filters and Restrictions. For example, if the maximum copies allowed on a printer is set to 10, and a user changes the number of copies of a held print job on that printer to 20, then an error is displayed when the job is released, and the held job is not released until the number of copies is less than 10. For more information, see Using Print filters: conversions and restrictions. Color mode—change from color to grayscale. Allow users to change a held print job from color to grayscale. Users cannot change from grayscale to color if grayscale was the original setting. They can, however, change from color to grayscale, then back to color. Note: This setting hides the	Force grayscale checkbox on the PaperCut MF Print Release screen on the device. If upgrading from PaperCut MF 18.1.4 or earlier and Advanced Print Scripting is detected, then Defaultis N.
In all other instances, Defaultis Y.
Duplex mode—change from 1-sided to 2-sided. Allow users to change a held print job from 1-sided to 2-sided. Users cannot change from 2-sided to 1-sided if 2-sided was the original setting. They can, however, change from 1-sided to 2-sided, then back to 1-sided. Note: This setting hides the	Force 2-sided checkbox on the PaperCut MF Print Release screen on the device. Copies—change the number of copies. Allow users to change the number of copies of a held print job. If upgrading from PaperCut MF 18.1.4 or below and Advanced Print Scripting is detected, the Defaultis N.
Account—change the account to which the job is charged. if print queueA print queue displays information about documents that are waiting to be printed, such as the printing status, document owner, and number of pages to print. You can use the print queue to view, pause, resume, restart, and cancel print jobs. user overrides to charge to a specific account do not exist. 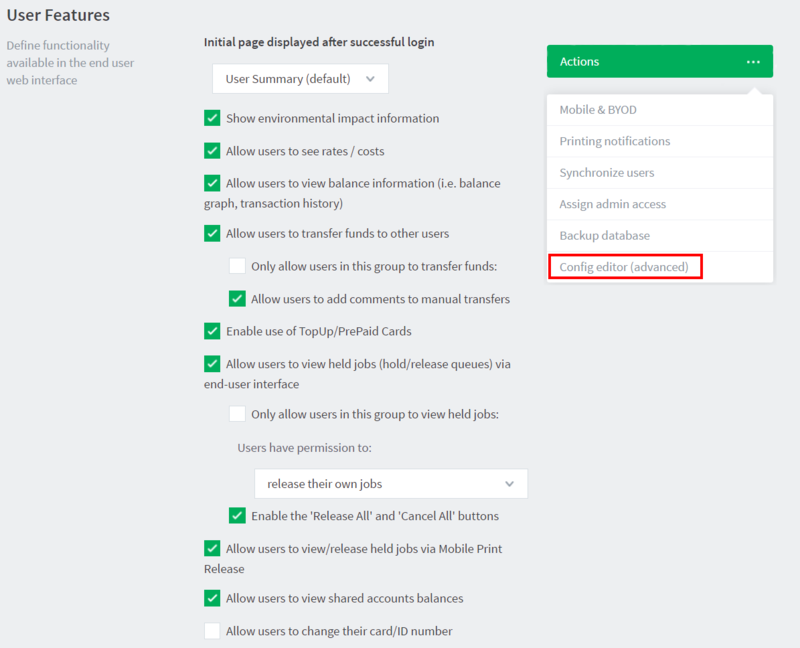 Important: This setting is overriden, preventing users from changing the account, if the account field is hidden (ext-device.show-print-job-account is set to N). Note: If the device's print queue is configured to override user settings and charge to a specific account (Printer Details page> Advanced Configuration area > Override user- level settings is set to Do not show account popups and allocate jobs to), then users are unable to change the account to which the print job will be charged. This ensures that users do not contravene existing print policies implemented via such print queue overrides. Important: This setting also prevents users from being able to assign accounts to held print jobs without accounts on the device. If you use a Site ServerSite Servers take over the role of a Primary Application Server in the event of network outages. Key roles taken over include authentication, copy and print tracking and Find-Me printing. Site Servers ensure continuous availability of printing resources to support key business functions over unreliable network links or during unplanned network disruptions., then by default PaperCut MF does not allow users to change print job settings of all held jobs on all your devices during an Application ServerAn Application Server is the primary server program responsible for providing the PaperCut user interface, storing data, and providing services to users. PaperCut uses the Application Server to manage user and account information, manage printers, calculate print costs, provide a web browser interface to administrators and end users, and much more. outage. This is because changes made to held print jobs during an outage are applied only if the jobs are also released during the outage. However, these changes are not applied, if they are released after the outage. If you experience frequent outages, where the Application Server switches between offline and online modes intermittently, then avoid changing the default settings. This is to minimize user confusion when changes are not applied. However, if your Site Server is in offline mode for a longer duration, perhaps a planned scenario, then change the default settings to allow users to change print job settings at the device. If using Site Servers, allow users to change the settings of held print jobs during Application Server outages (where the Site Server is online but the Application Server is offline).